Brakes battled past a spirited and enterprising Bishops Cleeve side to progress to the second round of the Southern League Cup at the Phillips 66 Community Stadium, writes Paul Edwards. Paul Holleran made five changes from the 11 that started Saturday’s match against Merthyr Town, giving game time to injury returnees Jamie Tank and Rob Ogleby while James Fry, Ross Oulton and Will Green also got some much-needed minutes on the pitch. The visitors flew out of the blocks, creating a chance inside the opening 60 seconds. Ed Major was played clear down the right before taking a touch and firing into the side-netting. Elliot Kennedy then latched on to a good cross from the right wing, but screwed his shot wide when he should have hit the target. Jack Watts then sent a low 25-yard drive into the hands of Tony Breeden. Ogleby registered Leamington’s first effort at goal, firing over from distance, while Kennedy went close again for Bishops Cleeve when his shot was deflected behind by Fry. Brakes composed themselves after the opening flurry and began to impose themselves on proceedings. Richard Taundry spotted Mitres’ keeper Sam Gilder off his line and almost embarrassed the custodian with a precise effort from distance that was pushed over the bar. Tank rose well to head the resulting corner just past the post. Lee Chilton blasted over the bar following a neat exchange of passes with Ogleby but the two combined again in the 19th minute to open the scoring. Chilton found Ogleby inside the area on the right and the striker turned sharply to fire into the far corner of the net. Undeterred, the visitors continued to pour forward at every opportunity. Jordan Stoddart shot wide, and Jack Watts centered for Major to curl a rising drive just over the bar. Ben George had a shot well saved by Gilder at the other end as Leamington continued to improve, and Oulton curled a low effort just wide of the upright after Chilton found him on the edge of the box. Chilton played Green into space inside the penalty area in the early stages of the second half but the striker was thwarted by a fine challenge from Luke Hitchman as he prepared to pull the trigger. Kennedy sent another effort for the visitors straight at Breeden before a driving run down the left from Chilton resulted in the ball being half-cleared to Joe Magunda on the edge of the area. However, with a gaping goal to aim at he shot wildly off target. Ogleby was presented with a couple of opportunities, driving the first wide of goal and heading another just off target before substitute Reece Mitchell made an impact within a minute of replacing Tank. 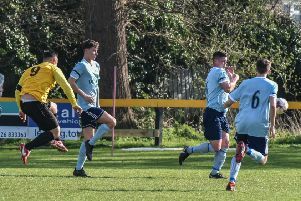 The youngster won a free-kick on the left from which Taundry supplied the cross for Jamie Hood to head home at the far post, with Stoddart only able to help it into the net on the goalline. Bishops Cleeve probably deserved at least a goal for their efforts but Watts dragged their final attempt past the post. Bishops Cleeve: Sam Gilder, Aaron Drake, Ryan Young (Jordan Bryan, 46), Jack Oldham, Jordan Stoddart, Luke Hitchman, Ed Major, Harlie Price, Elliot Kennedy, Oliver Burness (Leroy Odiero, 46), Jack Watts. Subs not used: Shane Bumphrey, Kirk Layton, Matt Wieczorek.